Beyond a modest macro and lack of optical stabilization (which only affects Panasonic owners), there's really very little to complain about here. The Olympus 45mm f1.8 delivers on its primary goal as a good portrait lens, and when closed to f4, doubles-up as one of the most uniformly sharp lenses in the Micro Four Thirds catalogue - or indeed any manufacturer's catalogue. The fact it delivers all this in a tiny form factor and out-performs the larger, heavier and pricier Panasonic Leica 45mm f2.8 at everything other than macro-photography further reinforces what a bargain it is. In short, the Olympus 45mm f1.8 is a no-brainer for owners of Micro Four Thirds cameras and easily earns our Highly Recommended award. Check prices on the Olympus 45mm f1.8 at Amazon, B&H, or Adorama, or Wex. Alternatively get yourself a copy of my In Camera book or treat me to a coffee! Thanks! The Olympus 45mm f1.8 is a short telephoto lens designed for Micro Four Thirds cameras including Panasonic Lumix G, Olympus PEN and Olympus OM-D models. Mounted on a Micro Four Thirds body it delivers an effective focal length of 90mm, making it a classic portrait lens, while the maximum aperture of f1.8 allows a shallow depth of field for a blurred background. Short, bright telephoto lenses may primarily be aimed at portrait work, but are equally suited to street photography and close-range sports, and are also surprisingly versatile for architectural and landscape shots. This particularly applies to the Olympus 45mm lens as it’s capable of delivering very sharp results right into the corners, but more of that in my results pages. To measure the performance of the Olympus 45mm f1.8, I directly compared it against the premium Panasonic Leica 45mm f2.8 lens for distant landscapes, standard portraits and macro close-ups, evaluating both for detail, along with their ability to render a pleasing blur at their maximum apertures. 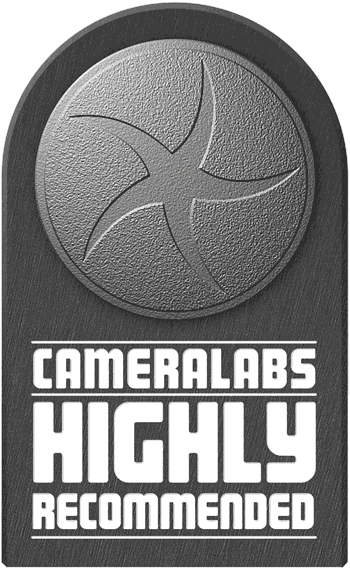 In my review I’ll also look at their physical designs and autofocusing speeds. So if you’re looking for the best short telephoto lens for Micro Four Thirds cameras, read-on! The Olympus 45mm f1.8 is a surprisingly compact lens even for the Micro Four Thirds standard. Measuring 56mm in diameter, 46mm in length and weighing just 116g, it’s beaten only by pancake lenses on size and weight. Indeed it’s only 56mm at the rear end to support the standard Micro Four Thirds lens mount. Beyond the mount, the barrel tapers down to a narrower diameter for the rest of the lens. This thing really is tiny. At the end of the barrel is a plastic ring which can be removed with a twist to reveal a bayonet fitting for the optional LH-40B lens hood which costs about $40 USD; a shame it’s not included as standard. I believe the ring can also be swapped for different colours, but I’ve never seen them for sale. Beyond this is a 37mm diameter filter thread, which also supports cheaper third party lens hoods. The lens design is pretty simple with the silver barrel sporting nothing more than a manual focusing ring. The silver barrel is a nice match for silver Olympus bodies, but in my view looked a little out of place mounted on the black Panasonic G bodies; unlike the similarly-styled Olympus 12mm f2 lens, there’s no limited edition black version available. The manual focusing ring turns smoothly and is a step-up from the manual focusing rings on the kit lenses, but it’s not quite in the same league as the silky smooth manual focusing rings of the Panasonic Leica models including the 45mm f2.8 macro. Speaking of which it’s worth talking about the Panasonic 45mm f2.8 in more detail as it’s a model many will compare to the Olympus 45mm f1.8. Both share the same mount and focal length, so the main differences in optical specifications concern their aperture, closest focusing distances and stabilization. With a focal ratio of f1.8, the Olympus lens enjoys an aperture that’s one and a third stops brighter than the f2.8 Panasonic, allowing quicker shutter speeds under the same conditions along with a shallower depth of field. You can see the difference in depth of field in my Olympus 45mm f1.8 bokeh results page. As a dedicated macro lens – indeed the first macro lens for Micro Four Thirds – the Panasonic Leica 45mm f2.8 boasts a closest focusing distance of 15cm allowing 1:1 reproduction. In contrast the Olympus 45mm f1.8’s closest focusing distance is a modest 0.5m, allowing just 0.11x magnification, or a reproduction that’s almost ten times smaller. You can see the difference in practice in my Olympus 45mm f1.8 macro results. Finally the Pansonic 45mm enjoys optical stabilization, whereas the Olympus 45mm has none built-in. This may be a moot point though depending on which body you own. All Olympus PEN and OM-D bodies sport built-in stabilization which works with any lens, so mount the 45mm f1.8 on an Olympus body and it’ll become stabilized; having stabilization built-into the Olympus bodies also makes the optical stabilization on the Panasonic lens redundant. 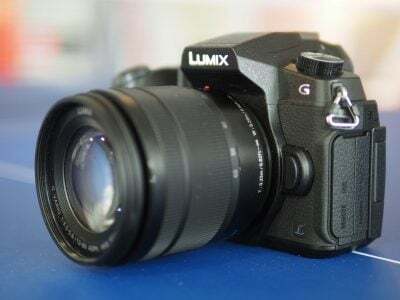 But if you mount the Olympus 45mm f1.8 on a Panasonic Lumix G body they’ll become an unstabilised combination which could be an issue depending on your usage. All important things to weigh-up, but arguably the most obvious difference between the two 45mm lenses is when you place them next to each other, as seen in the photo below. When it was released, the Panasonic Leica 45mm f2.8 was considered a fairly compact lens, but it now dwarfs the newer Olympus model. I’ve pictured them side-by-side below, and yes, I know I’ve left the transparent blue wrappings on the Olympus lens as requested by the supplier. But just look at the difference in size: as described above, the Olympus measures 56mm in diameter (quickly tapering further), 46mm in length and weighs just 116g, compared to the Panasonic at 63mm in diameter (for almost the entire length of the barrel), 63mm in length and 225g in weight. The Panasonic lens is still fairly light, but you’ll probably need a compartment in your bag for it, whereas the Olympus will squeeze-in almost anywhere and is so light to be virtually unnoticeable. So what’s inside the Panasonic lens to make it so much larger? 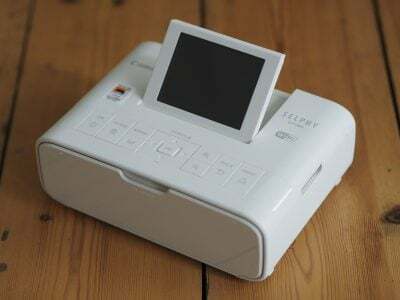 Well, it has a more complex optical design with 14 elements in 10 groups compared to nine elements in eight groups on the Olympus. 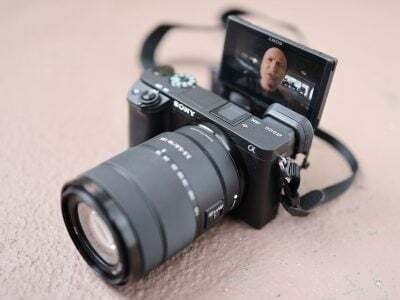 The more complex design of the Panasonic is in some part required for its macro capabilities and optical stabilization, but don’t forget the Olympus is optically brighter. In terms of build, the extra weight of the Panasonic lens inevitably lends it an air of greater confidence, but I having carried both for several months around the World I don’t believe it’s any stronger, and neither sport any kind of weather-sealing. I tested both lenses on a Panasonic GX1, G3 and an Olympus OM-D E-M5, and in terms of autofocusing, both were pretty much neck-in-neck on all three bodies, which is to say very fast, and very quiet too. The Panasonic 45mm f2.8 has a focus limiter that coincidentally sets it to the same 0.5m to infinity range as the Olympus. With this switch set, both lenses will generally lock onto their targets in less than half a second; even searching the full 0.5m to infinity range and back again will take less than a second. Disabling the focus limiter on the Panasonic obviously runs the risk of it searching through its entire 15cm to infinity range and as such can potentially slow down autofocusing on normal subjects at non-macro distances. That said, the Panasonic 45mm actually does a pretty respectable job at autofocusing on macro subjects which is more than can be said of many macro lenses from larger format cameras at their closest distances. Indeed it can be a joy to tap on the touch-screen of, say, the Panasonic GX1 to select the stamen of a flower or the head of an insect and actually find the camera and lens having a good stab at locking onto them without further intervention. So in terms of AF speed and noise, there’s little to choose between them which now leads me to the real meat of this review – the optical results. Across four pages I’ll show you how sharp the lens is when focused on a detailed landscape shot at infinity, how the sharpness compares to the Panasonic 45mm before then comparing both models in terms of depth of field and macro performance. You can start at the beginning with my Olympus 45mm f1.8 sharpness results, or skip straight to my Olympus 45mm vs Panasonic 45mm comparison, Olympus 45mm bokeh or Olympus 45mm macro results. Alternatively, there’s my Olympus 45mm f1.8 sample images and of course my final verdict.